two huge garbage cans in there and two cars. Actually, one car and one very large F150. Again, this wouldn't work if not for some serious organization. It works for us, but Mr. Maven would LOVE a dedicated shop complete with a vacuum system and a finishing room. 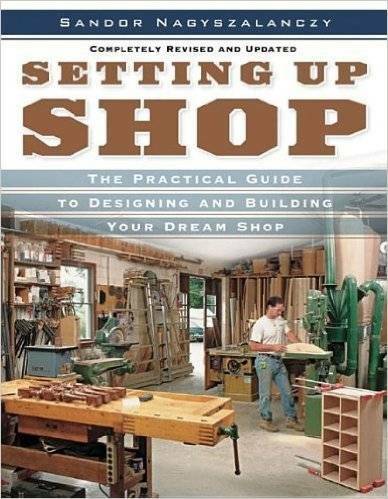 Kind of like Norm Abram's New Yankee Workshop, which is the first on our eye-candy list. Finding a still picture of Norm's shop is not easy, but I was able to find this shot taken a few years back. It really is the holy grail of woodworking workshops. Giving Norm a run for his money is the extraordinary space pictured below. The photo and shop belong to flickr user mtneer_man. Bob gives us a tour of his 3-stall garage that he uses as his shop. He added a dedicated spray-booth to the space. Nice. Lest you think this list is for large shops only, take a look at these next three. 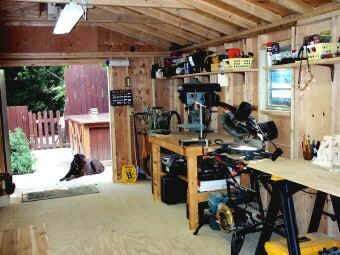 Matthew turned a one-stall garage into the perfect workshop using space-saving solutions. 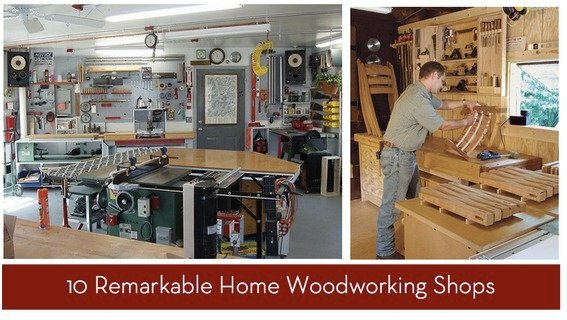 Read the entire Fine Woodworking article here to see how he did it. Vicki uses a 12' x 18' shed for her shop. No yard? No problem. Here are two very nice shops set up in the owners' basements. 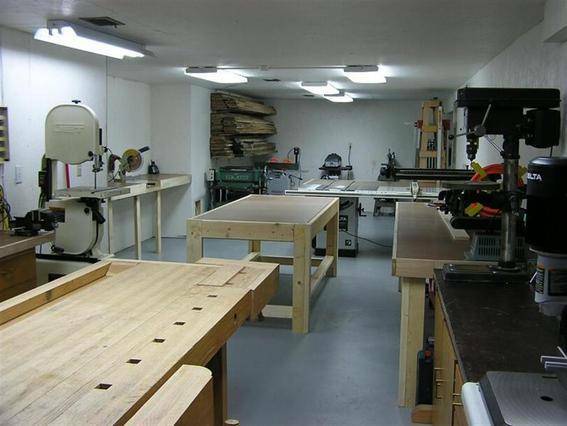 Dave Knaw's basement was unfinished and therefore a blank canvas, which he turned into a very workable workshop. John's shop is in his basement too. It's bright and light-filled and pretty amazing. And now, my sentimental favorite. 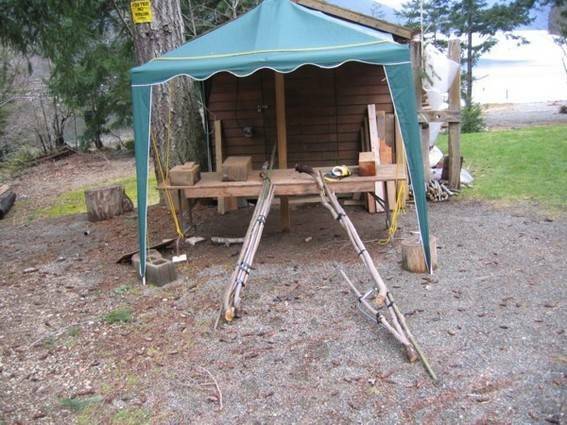 Wayne Newman is the gentleman who owns this workshop located on Vancouver Island, BC. In it he makes walking and hiking sticks and canes, which he sells. The permanent structure is an 8' x 10' wood shed, but because Wayne likes to work outside, he attached an awning--which he refers to as his 'addition'--to the front of the shed so he could do just that. May I use this space to ask if you can miter a 1-1/2 inch radius on one ebge of a standarg 2x4 = 3-1/2 x 1-1/2 inch net size. I will buy 2 lengths of 2x4 studs (hopefully soft white pine) by 41-1/2 inches long, and both lengths need to have 1 edge mitered to 1-1/2 inch by 41-1/2" long. Can you do this for me? Drool-worthy, indeed. Color me jealous...I'm almost good on the tools I need, but space to work and a smarter layout would change my process. 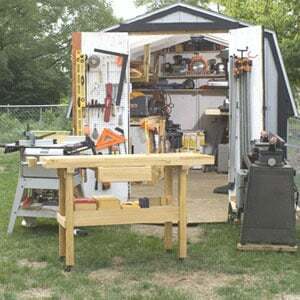 DIYMaven - You should share a photo of your garage. I'm sure we'd all love to see how you and your husband manage to have a hobby spot, and still protect your cars in Minnesota winters.